Two 15,000-SCFM thermally efficient RTOs were supplied to aid in the modification of 8 hearth furnaces converting top two hearth stages from their original evaporation to an expanded sludge processing function. Destroyed unpleasant odors and treated unburned gaseous organic compounds and COs while adding 20 percent capacity to existing plants at a fraction of the cost to install a third line. In 2015, NESTEC received an invitation to bid on two 15,000 scfm municipal waste water / sludge treatment facility thermal oxidizers to handle organic emissions from two existing Hankin ES multi-hearth furnaces. 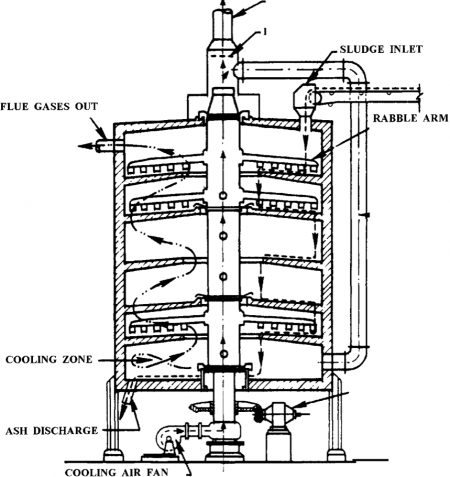 The 30+-year-old, 8 hearth furnaces were to be modified to convert the top two hearth stages of each from their original evaporation and “polishing” combustion function to an expanded sludge processing (incineration) function. In addition to meeting new regulatory emission limits, this would add 20 percent capacity to the existing plants, with little capital outlay for the furnaces and an overall cost at a fraction of the cost of installing a third line. The new air pollution control equipment would be designed to cool the exhaust gases and capture any particulate coming from the hearths’ exhaust, as well as to destroy unpleasant odors and treat unburned gaseous organic compounds and CO. In the vertically oriented, cylindrical-style multi-hearth furnaces, dewatered waste sludge is fed into the perimeter of the top hearth. Gravity and rotating “rakes” (rabble arms) move the sludge progressively downward through the hearths toward an ash discharge below the last hearth. Multiple hearth furnaces can typically be considered to consist of three zones. The upper hearths comprise the drying zone where most of the moisture in the sludge is evaporated. The temperature in the drying zone is typically between 425°C – 760°C (800°F – 1,400°F). Sludge combustion occurs in the middle hearths (second zone) as the temperature is increased to about 925°C (1,700°F). The combustion zone can be further subdivided into the upper-middle hearths, where the volatile gases and solids are burned, and the lower-middle hearths, where most of the fixed carbon is burned. The third zone, made up of the lowermost hearth(s), is the cooling zone. In this zone the ash is cooled as its heat is transferred to the incoming combustion air. To replace the original evaporation function, a venturi scrubber, a Wet Electrostatic Precipitator (WESP) would be added downstream of each furnace, to be followed by a thermally efficient two-chamber regenerative thermal oxidizer (RTO). Crossover dampers were to be supplied to allow any combination of furnaces and venturi / WESP / RTOs to run. The NESTEC-supplied system has run continuously with an online reliability of approximately 99.9 percent, demonstrating NESTEC’s market versatility and engineering and equipment quality. NESTEC received the award in April 2015 to supply WESP and RTO systems. The RTOs shipped in November 2015 and the WESP equipment in January 2016. The equipment was installed by the owner’s general contractor (who also modified the furnaces) in four months. The equipment was online in May 2016.